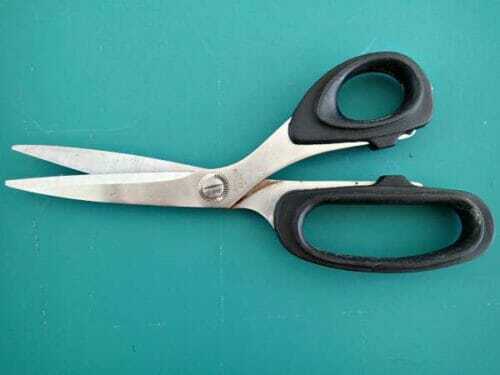 Today I'm looking at another sewing essential and something you use in every single sewing and fabric project – our sewing scissors or shears. Is this an area where you get what you pay for? 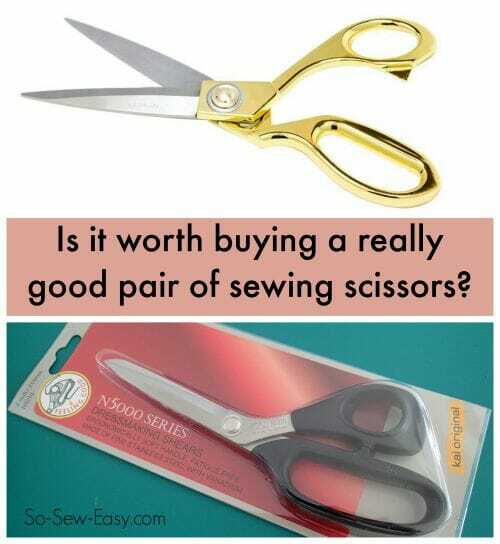 Can a budget set of sewing scissors do just fine for most of us? I do notice however when I try to clip into thick seam allowances, the fabric just bends instead of cutting sometimes. They aren't very sharp on the tips, so a new pair was in order. It's just not worth trying to find someone on the island to sharpen them. This is one place I don't think you want to skimp, but it's not really necessary to go top of the range unless you want to. 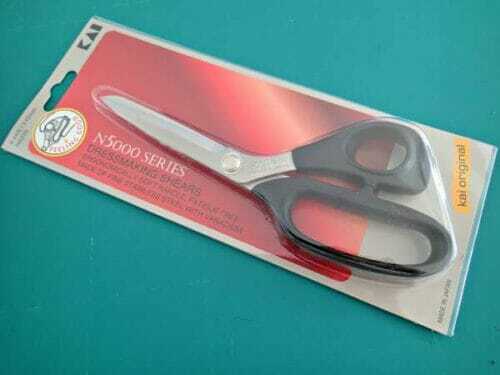 When it comes to sewing scissors, the top of the range can be very pricey indeed – designer limited edition scissors no less! A good pair of scissors should last you many years, and can even be resharpened later on, so it may be better to spend now for a nice set, than to buy a budget pair and only have to replace them within a few years like mine. Just as I was mulling over which ones to buy, I went to the Sewing Holiday event in the US and in my goodie bag – a pair of KAI Scissors. Hallelujah! So I was able to upgrade to some very nice quality sewing scissors for (sort of) free. I have the Kai 5210 with the 8 inch length. Highly recommended. You can get them at Amazon USA and Amazon UK. They might look similar, but the Kai scissors are far better than my originals ever were. Other Scissors you might consider that have a very good reputation are Ginghers. They do a standard range but also a very popular designer range too. I've seen some ‘collectible' Ginghers on sale at $200-250, so if that's in your budget, enjoy! You can get all sorts of fun designs on the handles as well as a smart looking shiny gold handled pair too. I've never used any so I can't comment on them personally, but I do see in our chat group that members are delighted with theirs. On sale on Amazon and Craftsy. Look out for a good coupon at JoAnn and get your new Gingher shears at 50-60% off on sale! This is the JoAnn Fabrics coupon page. So tell me about your sewing scissors. Do you still have your original pair? What brand do you love? Have you ever had them sharpened? I have a pair of the spring action shears and I love them. They are a lot easier on my arthritic fingers. I have had them sharpened once and need to have them sharpened again. But yes, if you have problems with your hands they are great. They are worth the money. I also have two pairs of the Fiskers spring action and they too work well although don’t stay sharp as long. Last year I bought a pair of Ginghers and love them. In the past I bought Fiskars and accumulated several pairs because they became dull after a year or so. All of them are left handed pairs. Recently I found a man who sharpens knives and scissors and thought I had hit the jackpot. It turned out that his machine is set up for right handed scissors only and cannot be adjusted for lefties. So, I have several pairs of dull scissors stashed in a drawer. I you can’t find a person to sharpen left handed scissors, may I suggest you donate them to a local non-profit organization? They may be too dull for fabric but may still work wonderfully on paper. Fiskers makes a sharpener for their scissors that works on both right and left handed scissors. It works fairly well, you have to use often depending on the types of fabric you are cutting. I use Ginghers for heavy work and have had 4 pair of 8” chrome plated ones for over 40 years. But now my favorite go to pair are my Fiskars that are spring loaded. When cutting for long periods of time they are very helpful, especially if you have wrist problems as I do. They are also lightweight and both Ginghars & Fiskars are very sharp and cut right to the very tip of the blades. My first sewing scissors were left-handed Wiss, given to me by my mother when I was about 14. I am predominately left-handed but in school learned (was pushed) by teachers to cut right-handed. In the end, I cut with either hand. I used those for years…until they were lost when one of my left-handed kids took them to school for an Home Ec class (remember those? Required for every student when mine were in school). After that, most of mine were Fiskers, but I coveted the Ginghers my mother had used for years. My mother made hats and purses and loved how easily the Ginghers cut through thick fabrics. She was very careful with them, even putting them back in the box after she was done using them. For my birthday 15 years ago my husband gave me some Ginghers and I have loved them. Like cutting butter with a hot knife…I love how many thicknesses it will cut through too! And now, I have my mother’s Ginghers too. Going through her sewing room after she passed away I found them… stored in the original box as always. What a treasure! A treasure Indeed! How lucky your mother to have a daughter to appreciate such an amazing tool. Scissors are the first critical piece of equipment that we use when we sew. Many years ago my mom’s shears were knocked onto the floor by my rambunctious brothers – a tip was broken off. She was devastated. They were an Italian pair of tailor’s shears with a 13” cutting edge. And they were irreplaceable – until last year. An American tailor arranged to have tailor’s shears made at the original Italian factory using the same moulds that were used over 35 years ago. He had 150 pairs made and I purchased a pair from the first ‘new’ run – I have #12. The factory shared photos of the first blanks being poured and of the whole manufacturing process. It was fascinating! And they are gorgeous! They cut like a hot knife through butter. When cutting. there is a sound that they make which is truly unique. I have this fabulous pair of shears that are identical to the pair that I first started to sew with almost 55 years ago. I was still a child, but those shears were such a joy to use that the weight of them didn’t bother me – I just used two hands to control them until my hands grew enough to cut with one hand. The new pair are exactly the same, right down to the weight, which is now too much for me. The problem I have is that just after they were ordered, I had an accident where my shoulder/rotator cuff ligaments etc., were badly damaged. I’ve done all of the physio, now I have to move on. So I have a beautiful pair of tailor’s shears, with a fabulous story, which are waiting for a grandchild who loves to sew, who will use them with love and respect, and appreciate them for being the gorgeous tool that they are. The moral of the story is this: Protect your tools, especially your scissors and shears. Have a safe place to keep them and put them back every time you put them down. I have a very heavy glazed pot with a piece of cork glued to the bottom so that it does not scratch any of my cutting surfaces. The cork also prevents it from sliding too easily – I make sure the pot is away from any edges so it doesn’t get knocked over. There is a well-padded piece of Persian lambskin in the bottom to protect my fine pointed scissors as I put them into it, with the handles up. I have used this same container for over 30 years to hold 14 pairs of scissors of every size and shape – not a single bit of damage to any of them. When you have a system figured out, it will become automatic to reach for the right tools when you need them and to put them away every time. It’s a matter of training yourself. I made sure that I kept my scissors hidden whenever we had helpers in the house – with decoy scissors left out for those inevitable emergencies when someone needs a pair of scissors. Seriously, though, if you look after them, they will give you years of use. Thanks so much for passing on those stories. Any chance you could share a short article with photos of the tailor’s shears with the group? What you’ve already written is nearly enough, just need the photos. I’m sure our readers will be as fascinated as I was to learn about it. How did you find out about the “new” pouring?